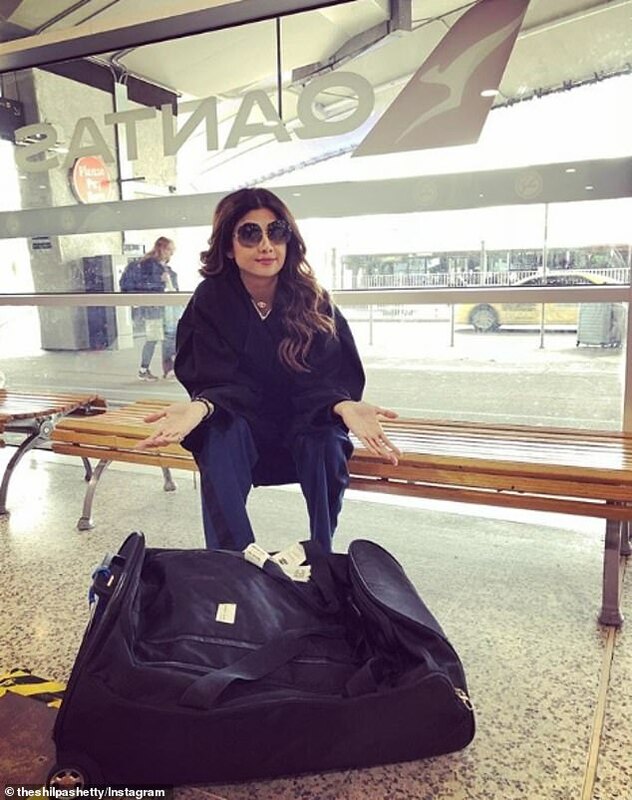 Bollywood star Shilpa Shetty has published a scathing rant accusing an airline worker of racism in a row over hand-luggage. The actress, 43, was travelling from Sydney to Melbourne with Australian airline Qantas when the argument over baggage took place. Shetty, who shot to fame in the UK after she was the target of racist comments during the 2007 series of Celebrity Big Brother, penned an angry post about her treatment, saying it was clear the employee didn't like 'brown people'. 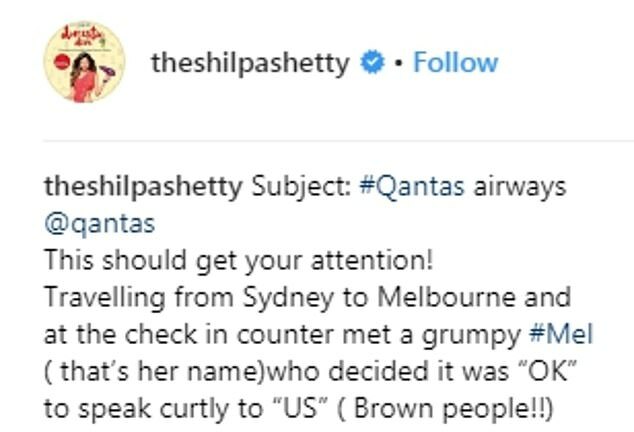 In the post, which has now been seen by 269,000 people, Shetty name-checked Qantas, saying: 'This should get your attention! Travelling from Sydney to Melbourne and at the check in counter met a grumpy #Mel (that’s her name) who decided it was "OK" to speak curtly to "US" (Brown people!!) travelling together. However, Shetty claims that when she returned to the original employee, she was refused again: 'Just being adamant especially when I told her this is causing a lot of inconvenience. We had no time to waste so we ran to the oversized baggage counter and requested her to put the bag through which she did after I told her that #Rude #Mel had issues! She said that her missive on social media was to make the airline aware of how she'd been treated. She wrote: 'Their staff must be taught to be helpful and TONE can’t change with preference to #COLOUR. '"WE" are NOT #pushovers and they MUST know that being #callous and #Rude will NOT BE TOLERATED.' She ended with a series of hashtags including: '#truthmustbetold #standup #equality #whatswrongisnotright'. MailOnline has contacted Qantas for comment. Shetty, 41, is one of Bollywood's most talked-about and photographed figures despite not having broken through in any major film roles. She is married to businessman Raj Kundra and the couple have one son together. She won fame when she was subjected to allegedly racist taunts on Britain's Celebrity Big Brother reality television series in 2007. Some 54,000 viewers complained to Ofcom and Channel 4 about the perceived racism on the show, after the late Jade Goody, a reality television star, was accused of taunting Shetty including calling her 'Shilpa Poppadom'. After she was evicted, Miss Goody, who died of cancer in 2009, said she was 'embarrassed and disgusted' by her own behaviour in the house but denied she was a racist. Gordon Brown, who was then Chancellor, was forced to defend Britain as a 'country of fairness and tolerance'.